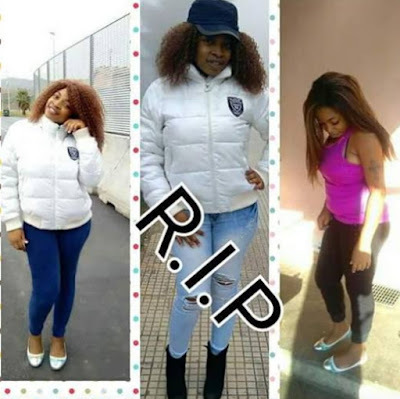 Meet Francis Miracle a 26-year-old Nigerian citizen murdered by her boyfriend at a refugee camp where she had been since she arrived Italy in December 2016. According to police report, Francis Miracle a graduate of the University of Port Harcourt was killed by his jilted Malian boyfriend after she met another guy from Nigeria. Her killer, a 30-year-old man from Mali based in Northern Italian city of Catalina reportedly visited the camp on Tuesday the 2nd of January 2018 where he stabbed her to death. Another source who was at the camp at the time Francis was murdered said the Malian tried to persuade Francis and her two kids to relocate to his home but her refusal got him upset. He reportedly used a knife to stab her on the neck in front of her little kids. Waiting we go call this one. God saved her she got to Italy safely without being drowned or sold into slavery. This Satan from Mali just quench her life without any relevant reason.